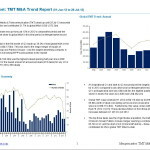 Technology, Media & Telecommunication (TMT) deals up until 29-Jul-13 amounted to US$ 232.5 bn and contributed 21.7% to global Mergers and Aquisitions (US$ 1,072.3bn). The market share was up from just 13% in 2012’s comparative period and the highest market share to global M&A in this time period on Mergermarket record (since 2001). 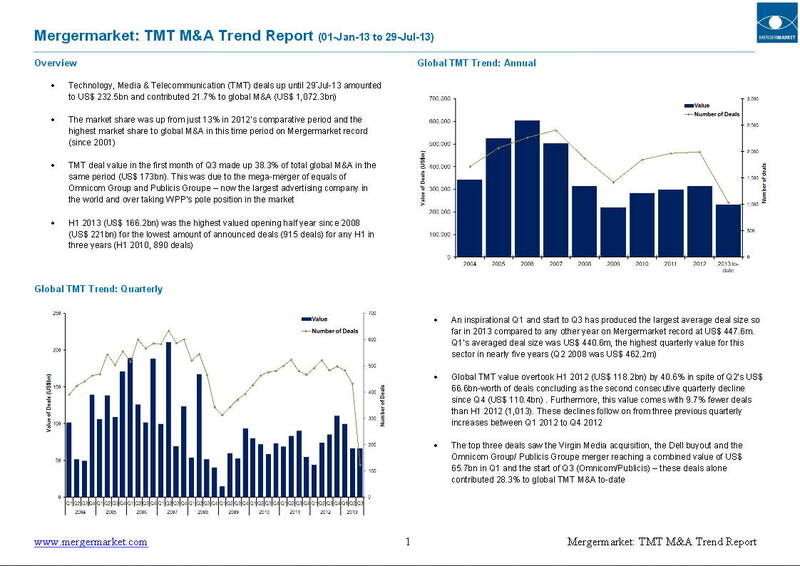 TMT deal value in the first month of Q3 made up 38.3% of total global M&A in the same period (US$ 173bn). This was due to the mega-merger of equals of Omnicom Group and Publicis Groupe – now the largest advertising company in the world and over taking WPP’s pole position in the market. H1 2013 (US$ 166.2bn) was the highest valued opening half year since 2008 (US$ 221bn) for the lowest amount of announced deals (915 deals) for any H1 in three years (H1 2010, 890 deals). Posted in Angel Investment, Business Intelligence, eBusiness, Economy, Entrepreneurship, Global, Mergers & Acquisitions, Private Equity, Venture Capital and tagged M&A, Media & Telecommunication, mega-merger, Mergermarket, mergers and aquisitions, Omnicom Group, Publicis Groupe, Technology, TMT, Trend report, WPP.